Douglas Engelbart never would have though that he would imprint a mark in every computer geek. Last week I noticed a mark in my right wrist which was not present in my left wrist. This mark was so prominent that it would have occurred due to over stress in that particular area which you can find in the picture below. 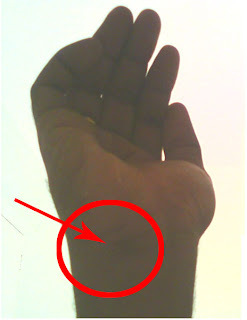 For Left handed people who will be using their computer mouse often can find the similar mark in their left wrist. After identifying this I started to observe the same in all the people who I interact. Two days before I had a group discussion where I had to meet a group of 12 people who work in different companies. In that lot after the group discussion was completed, though we did not have an introduction with each other I made a probably a good guess on who were from IT field and who probably are not from IT. I identified this, just from the mark they have in the right wrist. After reading this you may also start observing this mark in every one’s wrist. The horizontal mouse which is widely used creates a stress in our wrist, and also creates a forearm twisting. Evoluent has come up with a new vertical mouse which will eliminate these problems. Even Steven Feuristein once made a remark on this mouse long time back.